Several months ago we shared the Chicago ban on crib bumper sales in stores. Thanks to a news story investigation by Today, the dangers of placing other items in the crib with an infant is receiving national attention. 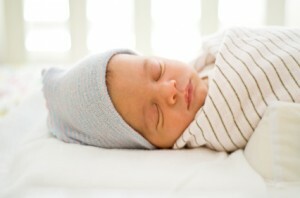 Doctors have warned parents for years about placing soft products in cribs with infants younger than one. Now, the Centers for Disease Control and Prevention is saying that more and more infants are suffocating in their sleep and they’re telling parents that nothing should go in the crib but the baby. Even the American Academy of Pediatrics says that extra items, like crib bumpers and blankets, are dangerous and they say that parents shouldn’t use them. Yet, you can walk into almost any store in the country and find crib bumpers, cute and cuddly stuffed animals, accessory pillows and more. Parents say the message is rather confusing. Experts say that infants are dying from these products, but manufacturers and stores are pushing, promoting and selling. To find out just how confusing shopping for a newborn can be, Today went undercover to some of the most popular stores in the country. A clerk at Target, who claimed to have had all the safety training on cribs gave no warning at all to investigators as they picked through crib bumpers. “So that’s good, to have a nice, soft thing to keep the baby safe? Even the newborns?” the investigators asked. Yet, doctors say that this is when babies are at the highest risk for suffocation while sleeping. But just a few feet from where she stood, bumpers, blankets and more were on display. The CDC says that 665 babies died from “accidental suffocation of strangulation while in bed,” in 2009 alone. Preston was one of the many babies to have been lost to an extra item in the crib. Laura says that she and her husband bought the bumper because they thought it would actually protect their son. They’re marketed that way, after all. How could the possibly be dangerous? Dr. Eileen Tyrala, pediatrician and medical director of Cribs for Kids is one of the many doctors who feels as if manufacturers and stores are placing profit over infant safety. “The manufacturers should stop making the bumpers, which really have no place in a baby’s crib and no place, therefore,” said Tyrala. But manufacturers seem to disagree. Rosen spoke with a representative of the manufacturers of crib accessories. “Parents need to make a decision for themselves what items they would like to use in their crib,” said Linda Woody of the Juvenile Products Manufacturers Association. “Parents are truly the experts of their child,” Woody replied. But just like the sugary drinks that claim to contain Vitamin C, the message parents are receiving from manufacturers is confusing. Parents are told that these products can prevent limb entrapment and head injury. The message that they’re unsafe isn’t loud enough. The government is now getting involved in some areas – Chicago has banned the sales of all crib bumpers from their stores and the entire state of Maryland is considering a ban as well, but experts say it still isn’t enough. Laura Maxwell agrees. Laura and her husband are now suing the manufacturers of the bumper as well as the store that sold it to them. The industry says they are putting safety first and that this is not about making money. They stated that some products do come with a warning. But that’s just some products – not all. Again, doctors and experts are saying that nothing should be in the crib with baby before they turn one, nothing. This includes crib bumpers, stuffed animals, blankets, pillows, toys…NOTHING. To keep baby warm, doctors and experts recommend zip up sack sleepers. These do not come over baby’s face and they can help keep baby warm. These can be easily zipped over a onesie, pants and socks in the winter or if you’re overly concerned about the baby getting chilly. Gro Furniture – Convertible cribs that grow with your child!